Aquilegia is an elegant flower that is easy to grow. It reaches around 60cms in height making it ideal for the middle of the border. It also comes in a range of colours, so you can find a variety to suit any scheme. The plant looks great in relaxed planting arrangements and cottage gardens. Aquilegias have a light airy appearance. Their leaves are small and rounded and the tall flower stems rise high above the foliage. The flowers are distinctive and unusual, having 5 petals that flare out from the base, surrounded by 5 larger sepals. Many varieties also have long, nectar holding spurs that arch backwards out of the flowers. The flowers come in a variety of colours, mainly in light shades of blue, pink and purple, though there are also stronger red and yellow varieties. They bloom in mid-spring and can be a useful filler after spring bulbs are finished and before the late spring and early summer flowers are in full swing. They remain in flower for around six to eight weeks, depending on the weather. The flowers are popular with bees and other pollinating insects at a time of year when there is not much else in bloom. Aquilegias are easy to grow from seed and will also self-seed in the garden. They are not fussy plants and will grow well in a variety of situations, requiring little attention. They die back over winter and come back to reliably flower year after year. They are not long-lived plants, but they do self-seed so once established there will always be some aquilegia in your garden. Aquilegia gets its name from the Latin ‘aquila’ meaning eagle. This is a reference to the shape of the flowers, which have curved spurs reminiscent of an eagle’s talons. Interestingly the common name, Columbine, also comes from a bird, this time the dove. It is true that the flowers do look a little like birds with their wing-like petals and arching spurs. Aquilegia is mentioned often in literature under its common name, Columbine. Both Chaucer and Shakespeare write about the plant. It was used as a garnish for food and as medicine. As the leaves are toxic this is certainly not recommended. Aquilegia vulgaris is a Native of Europe, including Britain. In the late 19th century a florist called Douglas began to cross this with Aquilegia caerulea, canadense and chrysantha which resulted in the long-spurred hybrids that we know today. There are also varieties that are native to Asia and America. This article will look at how to grow these elegant plants and some of the best varieties to choose. We will also look at any problems you may encounter and the preventative measure you can take to ensure your plant stays healthy and provides you with plenty of flowers. There are many varieties of aquilegia in different colours and heights. Some varieties prefer full sun and some like more shade. This means there is a suitable aquilegia for every position in the garden. Many varieties have distinctive long spurs on their flowers. The leaves are harmful if eaten. This is a cottage garden favourite and provides an abundant display of long, spurred, red and yellow flowers in late spring. It prefers full sun and will reach a height of 80cm (31 inches). This is another long-spurred variety, this time in china blue and white. It looks wonderful in a cottage garden or border and grows to around 85 cm. It flowers from May to June. With rose pink flowers and a white corolla, this long spurred variety has many branched flowering stems that reach 80cm (31 inches). It flowers from May to June. The pure-white flowers of this variety make it a cottage garden favourite. It prefers full sun and flowers from May to June reaching a height of 85cm (33 inches). Another cottage garden favourite this variety has long spurred lemon-yellow flowers above blue-green foliage. It is a shorter variety reaching a maximum height of 60cm (23 inches). It prefers full sun and flowers in late spring. This variety has large white blooms on stems that reach a height of 80cm (31 inches). It is an early flowerer and starts developing flowering stems as soon as April. As well as enjoying full sun, this variety tolerates shady conditions well and can be used to lighten shady borders. It looks good with other spring flowers such as primroses and bulbs. This modern variety is a truly striking addition to the garden, featuring, as the name suggests white and deep purple, nearly black flowers. It prefers light shade and is a taller variety growing to around 90cm (35 inches). This double flower resembles a frilly petticoat. It is cerise at the base and white at the petal tips. A gorgeous addition to an old-fashioned cottage garden, this is a shorter variety growing to a maximum height of 60cm (23 inches). This is one of the oldest forms, recorded in the 17th century as Rose Columbine. It was given its modern name after Charles Darwin’s grand-daughter. Its thickly clustered petals are delicate pink, green and white making it a lovely addition to a cottage garden. It is sometimes known as granny’s bonnet and grows to 90cm (35 inches). This is a spurless variety with deep, maroon flowers that look wonderful with the bright green foliage. It prefers light shade and grows to around 90cm (35 inches) tall. This is a wine-red double spurless variety. It can range from 60-90cm (23-35 inches) in height and flowers well, even in shade. This variety has green leaf buds that open into spurless flowers which are white and tinged with green tips. It’s a very early flowering variety, sometimes as soon as February and it reaches 60cm (23 inches) in height. Aquilegia is not a fussy plant. They will grow well in most conditions. They do prefer some space around them, so make sure they are not crowded in by other plants. They are easy to grow from seed and come back year after year. They are not long-lived plants, but they will self-seed ensuring you have plenty of them in your garden for the future. Sometimes self-seeded plants have different characteristics to their parent plant which adds an element of surprise when growing aquilegia. The plants can be sown from seed or bought as plants. Aquilegia plants should be planted in deep soil with their crown at ground level. New plants will need to be kept watered until they have established and are putting on new growth. If you plant more than one variety, they may well cross-pollinate. This will result in new colours and combinations. Many gardeners love this, however, if you have a favourite variety that you want to stay true to type then you may want to consider limiting yourself to that one variety. Alternatively, cut the plants back before they produce seed heads to prevent self-seeding. You will have to be very vigilant with this approach however as they self-seed so readily and even one missed flower can result in new plants seeding. You may also get different colour combinations and types due to your plants being cross-pollinated with neighbouring plants. In addition, recessive genes in these hybrids can come to the fore in self-seeded plants. You should plant aquilegias in late-summer and they will flower in the following spring. Most varieties will grow in full sun or dappled shade. Many like morning sun but some shade in the hottest part of the day. Some are more tolerant of shade than others so check the details of the variety you have chosen. They do not like to get too dry in summer or too wet in winter. Aquilegia like deep soil but they are unfussy about the type. They will grow in clay as long as they don’t become waterlogged in winter. Some varieties that originate in alpine regions prefer well-drained loam. Add well-rotted manure or humus when planting. These can also be applied as a mulch. If self-sowing becomes a problem, you can cut the plants back in mid-summer before the seed pods have formed. If you wish to sow more plants, remove seed heads before they disperse their contents. You can then sow these elsewhere to prevent the original plant from becoming overcrowded. Aquilegia looks good in a relaxed or cottagey planting scheme. Despite being tall, they are light, airy plants, so they are good choices for the middle of the border. There are varieties that enjoy full sun and some that prefer dappled shade, so one can be found to suit most light conditions. They are unfussy about soil as long as it is deep enough for their tap roots. Aquilegias do not require much care. They will happily flower year after year and self-seed so that you always have new plants. Do keep them watering in very hot dry spells, especially if they are in full sun. Most Aquilegias do well in full sun, however, they do not like the combination of heat and dry soil, so water them regularly if they are in a sunny position. Mulching will help to keep the roots cool. Remove seed heads before they have a chance to disperse seeds. You can cut back the foliage once it starts to die back. Aquilegia is a favourite of the cottage garden as it provides good spring interest. Early flowering varieties go well with spring bulbs and primroses. May flowering varieties look good with tulips and alliums. White varieties lighten shade and contrast with the cool greens of a shady spring garden. As many tolerate shade they go well with other shade lovers such as hostas, hellebores and bleeding hearts. The dramatic maroon and cerise varieties look excellent against green foliage such as ferns. They are a useful plant for the border as they are light and airy and don’t block the plants behind them from view. Seeds can be sown directly in their final flowering position throughout spring. If possible, get some seeds from a friend or fellow gardener as the seeds have a short period of viability meaning commercial seeds sometimes fail to germinate. Failing this, you can buy some plants and then scatter the seeds once they have flowered to generate more plants. The seeds need light to germinate, so simply press them into a weed free, well-raked area of your choice. If you do this in late summer they will germinate by the following spring. It will take 2 years from planting the seed for them to bloom, but they are perennial so will come back every year after that. You can also start the seeds indoors. They benefit from some chilling, so place the seeds in a bag of moist seed compost in the fridge around 8 -12 weeks before you wish to plant them. Then remove the bag and put the contents in a pot or seed tray and place in a warmer place until they germinate. Transplant the strongest seedling to larger pots and harden them off in a sheltered part of the garden before planting out after the danger of frost has passed. Aquilegias are not prone to many pests. The leaves are poisonous so many species will not eat them. Even slugs and snails won’t touch the leaves, though they may occasionally eat the non-poisonous flowers, especially of large white varieties. Leaf miners and aquilegia sawfly can sometimes be a problem. Until recently aquilegia were not prone to many diseases. However, there is a new disease, downy mildew, which is virulent and has no chemical control. The Touchwood National Collections of Aquilegias have been severely affected. 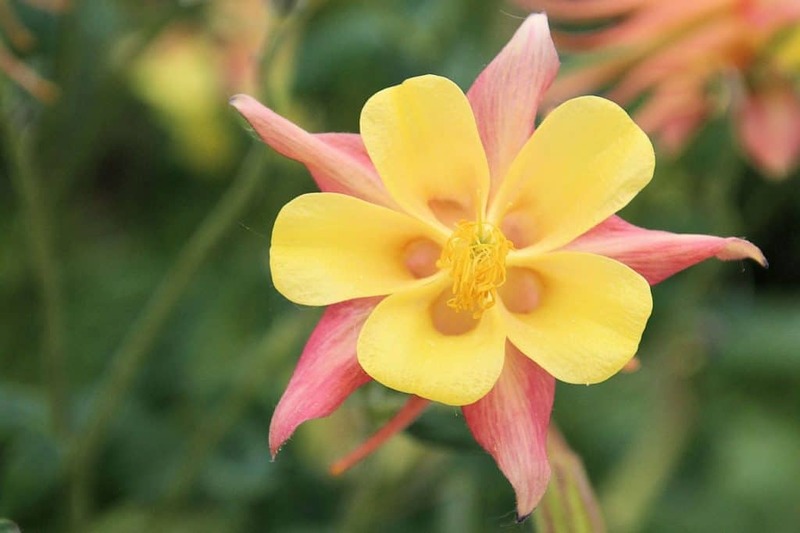 These are the biggest problem pest for aquilegia. They tunnel inside the leaves and make an unsightly mess. If you cut back the foliage after flowering this should avoid the problem. The larval stages of the sawfly can defoliate aquilegia plants, leaving only the leaf veins and stalks. The sawfly lays its eggs on the undersides of the leaves. When they hatch in spring the larvae start to munch the leaves from the edges towards the midveins. They look like grubby caterpillars but develop into a non-stinging wasp-like fly. To protect your plant, check the leaves during April and May for eggs, larvae and signs of damage. The larvae can be picked off by hand or sprayed with insecticidal soap. Fortunately, the damage is mainly cosmetic and your plant will recover. Powdery mildew often appears as white, powdery spreading patches leaves and flowers. To prevent powdery mildew ensure your plant has good growing conditions. It should be kept moist but not waterlogged. Do not overfeed as this can encourage lush, sappy growth that is susceptible to pests and diseases. Using a mulch can help keep the plant moist. If your plant is affected, destroy all fallen leaves and plant debris to reduce the chance of spores affecting new growth in spring. You can also use a fungicide if necessary. Downy Mildew is a new fungal disease of aquilegias which is killing plants. Symptoms include lighter yellowy patches on leaves, leaves disintegrating, new shoots that are lighter in colour and leaves that are smaller and often deformed. There may also be brown patches on leaves and stems. 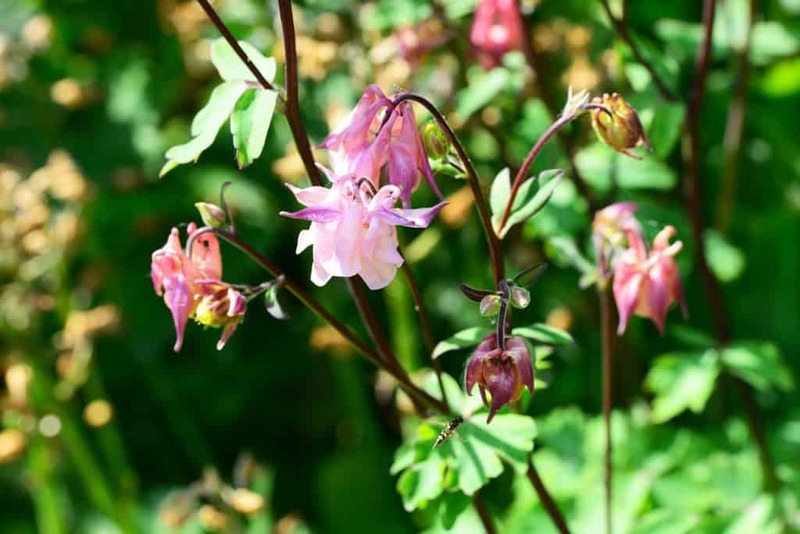 This disease needs moist conditions so keep your aquilegia foliage as dry as possible. Avoid planting close to other plants that hold moisture. Water at the base of the plant rather than on the leaves and stems. Water early in the day to allow water to evaporate. Keep the area weed free to allow for air circulation. Mulching just before plants come into growth may help prevent spores being splashed onto new leaves. Cut away damaged and infected plant matter. Then at the start of winter cut the plants back to soil level. You may have to remove and dispose of severely affected plants. Q I bought a delightful white variety of aquilegia for my white garden, but it has self-seeded and all the new plants are different colours. I haven’t planted any other varieties so how has this happened? Your aquilegias may have been fertilised by bees travelling to neighbouring gardens as they very easily cross-pollinate. To prevent this from happening in the future, you can cut off the seed heads before they have a chance to scatter their contents and buy any future additions, so you can clearly see they are exactly the type you want. However, because cultivars are complex hybrids they often contain recessive genes. This means they can show characteristics from other varieties in their family history. Q I have been growing aquilegia for many years, but recently they have not been doing well. Many have brown spotted leaves and stems and generally look sickly. Nothing has changed in my garden so what could be causing this? Unfortunately, there is a new disease that is badly affecting aquilegia. It is called downy mildew and can be devastating to the plants. Follow the advice in the diseases section of this guide to see if this improves the health of your plants. As there is not yet a treatment for this disease the best you can do is ensure the conditions are as good as possible for your plant. Q I have planted several aquilegias, but they have not flowered. What could be wrong? Firstly, plants grown from seed will not flower until their second year. It is also possible that the light conditions are not right. Some aquilegia like full sun to flower well. However, some prefer dappled shade. Most like sun in the morning with a little protection from very strong sunlight in the afternoon. Check your variety and move your plant in the autumn if necessary. You could plant them among shrubs or roses to provide dappled light.